By Sydney Padua, author of The Thrilling Adventures of Lovelace & Babbage. Read the longer biography of Ada Lovelace by Suw Charman-Anderson, taken from our book, A Passion for Science: Stories of Discovery and Invention, but for a short overview of her life and achievements, read on! 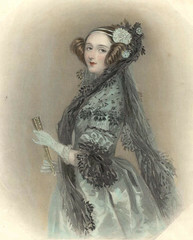 The woman most often known as ‘Ada Lovelace’ was born Ada Gordon in 1815, sole child of the brief and tempestuous marriage of the erratic poet George Gordon, Lord Byron, and his mathematics-loving wife Annabella Milbanke. Fearing that Ada would inherit her father’s volatile ‘poetic’ temperament, her mother raised her under a strict regimen of science, logic, and mathematics. Ada herself from childhood had a fascination with machines– designing fanciful boats and steam flying machines, and poring over the diagrams of the new inventions of the Industrial Revolution that filled the scientific magazines of the time. At the age of 19 she was married to an aristocrat, William King; when King was made Earl of Lovelace in 1838 his wife became Lady Ada King, Countess of Lovelace. She is generally called Ada Lovelace, which is a little incorrect but saves confusion! She had three children. Ada Lovelace died of cancer at 36, a few short years after the publication of “Sketch of the Analytical Engine, with Notes from the Translator”. The Analytical Engine remained a vision, until Lovelace’s notes became one of the critical documents to inspire Alan Turing’s work on the first modern computers in the 1940s. Her thwarted potential, and her passion and vision for technology, have made her a powerful symbol for modern women in technology. Read some of the primary documents by or about Ada that are online, or read the longer biography of Ada Lovelace, taken from our book, A Passion for Science: Stories of Discovery and Invention.